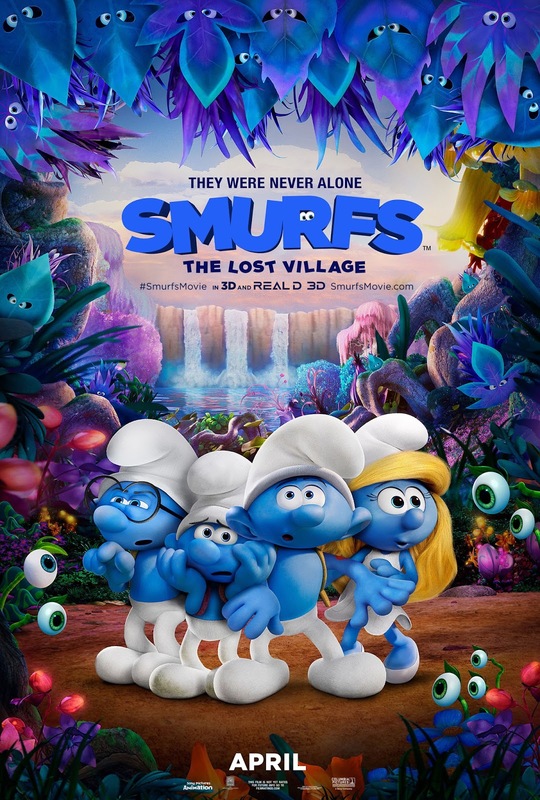 Andrew Smith's Blog: Smurfs: The Lost Village Opens April 7th! TWO TICKETS TO GIVEAWAY!! Smurfs: The Lost Village Opens April 7th! TWO TICKETS TO GIVEAWAY!! Smurfs: The Lost Village opens up in Movie Theaters on April 7th. The movie follows the success of the past movies. This one is an entirely new fully animated movie. Some of the voice actors/actresses are Ariel Winter, Michelle Rodriguez, Joe Manganiello, Julia Roberts, Mandy Patinkin, Ellie Kemper, Rainn Wilson, Demi Lovato, and many more. In this fully animated, all-new take on the Smurfs, a mysterious map sets Smurfette and her best friends Brainy, Clumsy, and Hefty on an exciting and thrilling race through the Forbidden Forest filled with magical creatures to find a mysterious lost village before the evil wizard Gargamel does. Embarking on a rollercoaster journey full of action and danger, the Smurfs are on a course that leads to the discovery of the biggest secret in Smurf history! The website is very clever and has an appealing feature which takes you from the forest to the village to inside a Smurf house. The website contains neat looking desktop backgrounds, mobile phone, iPads, and Social Media profile pictures and cover pictures that fans can download for FREE and use them. The website also contains recipes for marshroom houses, popsicles, smurfberry pie, and strawberry cake. It has coloring sheets, instructions on how to draw different Smurfs, quizzes, and games to enjoy. You can also purchase tickets to see the new movie! I think I'd like Clumsy. Always did love the underdog, lol! The idea of a lost village kind of reminds me of The Borrowers. Want To Boost Your ClickBank Commissions And Traffic? Bannerizer makes it easy for you to promote ClickBank products with banners, simply visit Bannerizer, and grab the banner codes for your selected ClickBank products or use the Universal ClickBank Banner Rotator to promote all of the ClickBank products.